Other musical forms can be placed at various points elsewhere on the spectrum. Some are so foreboding as to challenge the listener: industrial, grindcore and Scandinavian black metal are just a few of the styles that chase away all but those most intent on divining their charms. Somewhere in the middle, but closer to the latter types in terms of accessibility, lies the dreamscape musical world of Yonder. Calling their collaboration “music from over there,” the duo of Asheville synthesist/multi-instrumentalists Sally Sparks and Chris Stack make music possessed of a “take it or leave it” sensibility. Which isn’t to say that there’s anything musically arrogant, standoffish or otherwise cold and impersonal about the seven tracks on Pearl Diver, Yonder’s debut release. The placid, near-ambient tunes define subtlety; the listener must decide s/he wishes to experience this music, else it will recede into the background. Like any journey work taking, “Reaching Aleppo” takes its time to really get going; the experience is in the journey itself, not the arrival. Several minutes into the piece, what sounds like a human voice embarks on a series of melodic lines evocative of the musics of northern Africa. It’s quite possible that “voice” is in fact Sparks playing her Haaken Continuum, perhaps the most revolutionary instrument to join the keyboard/synth world in the last decade or more. The second cut – Pearl Diver‘s title track – features guest musician Ben Hovey of Evil Note Lab and other boundary-pushing musical projects. 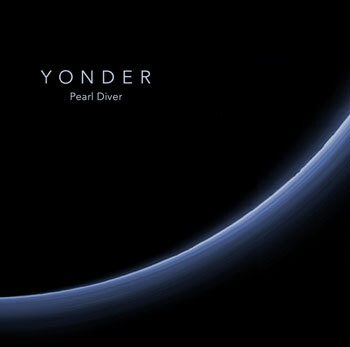 Because Yonder is far from standard guitar/bass/drums-type project, it’s difficult to know who does what on any given track, but the lush “Pearl Diver” is built around a kind of musical dialogue between dreamy synthesizer lines and a wind instrument (or an electronic simulacrum thereof). It, too features a kind of exotically Egyptian-style melodic line, one that conveys melancholy and (perhaps) deep pain. Some ten minutes into the track (which runs over 21 minutes total), the arrangement adopts a more conventional style, one that features sounds of a more grounded and familiar character (Rhodes electric piano and cello, or – yet again – digital representations of those instruments). “The Darkest Night Passes” can be thought of as an ambient/trance answer to Chant, the 1994 album from the Benedictine Monks of Santo Domingo de Silos. While vocals – or electronic versions of voices – only appear in parts of this relatively brief tune, the transcendent nature of Gregorian chants is nonetheless evoked even by the instruments played by Sparks and Stack. And transcendence – or at least a meditative state – is encouraged by “Niroda Satya,” a track featuring bells, sparkling bits of piano and what sound like the playing of the rims of water-filled glasses. Odd bits of spoken word flit in and out of the mix, adding an air of mystery. The title of “At Night We’re All the Same” makes an intriguing assertion; the track itself doesn’t explicitly address the idea – in fact there are no lyrics at all on Pearl Diver – but the piee bears a decidedly cinematic quality not unlike the instrumental cuts on some of Brian Eno’s mid 1970s (so-called) pop albums. Percussion is a rarity on Pearl Diver, but something like it crops up on “Hayabusa Terra,” along with stringed instruments. The album’s ever-present subtlety means that those instruments are used less as means by which to convey a melody, and more as devices to insert deft splashes of tone color here and there. The album concludes with a 12-plus minute work, “After the Storm.” And here the title relates to the music in a more direct manner; there’s an underlying sense of placidity – the kind that comes after a burst of activity – within the gurgling tune. While never moving any closer to a rock aesthetic than, say, Cluster and Eno’s collaborations, “After the Storm” does have a kind of space-rock feel. The music on Pearl Diver was largely recorded live in the studio; in character, it falls somewhere between composed and improvised; in many ways it’s reminiscent of a little-known Porcupine Tree album from 1998 called Metanoia. But that balance – including a carefully thought out set of decisions regarding what instruments and sonic textures were to be applied to each track – results in a varied and – it must be said again – sublimely subtle listening experience.